To provide a platform for the marginalized and be a voice for the voiceless: That is the primary goal of the #GivePower movement, an initiative developed by the eight students that comprise Indiana Tech’s SS 2900—Community & Social Movements class. Soon, messaging about the causes they care about most will begin emanating out into the world from the #GivePower page on the Indiana Tech website and the university’s social media channels. “My students have spent most of the semester learning the theories behind community and social movements. Now, it’s time for them to begin applying those concepts to create some positive social change,” said Courtney Shull, associate dean of Indiana Tech’s College of Arts and Sciences and assistant professor of psychology. Through social media campaigns, awareness events and displays of fliers and posters, professor Shull’s class plans to educate and spread awareness in the community, and empower and offer strategies to affected populations. “This movement is about giving power, instead of taking it away; empowering people and encouraging them,” said child development major Kiera Carlisle. For Carlisle, she wants to give power to the LGBTQ community. Adams wants to give power to those dealing with mental illness. Connor Barney, also a psychology major, wants to give power to domestic abuse victims. Oscar Martinez, a criminal justice major, wants to give power to abused animals. His criminal justice classmate, Scottie Sopko, also has an animal-focused cause: pit bulls. Alexis Scott and Travis Jacobs, two additional criminal justice majors, want to be voices for human populations; Scott for today’s youth and Jacobs for those suffering abuse. For pre-law major Matthew Robinson, empowering others to stand up for themselves is an important goal of the movement. “We want to help people recognize how they are getting abused and see that it’s not a hopeless situation. There are steps you can take to combat abuse, there are support groups and other resources that will help you. We want to show people strategies that can help them,” he said. 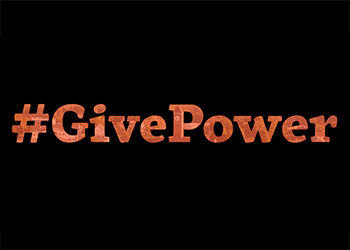 The culminating piece of coursework involves the creation of a resource package that will help people create their own #GivePower movement.